These are IGBT devices developed using an advanced proprietary trench gate and field-stop structure. 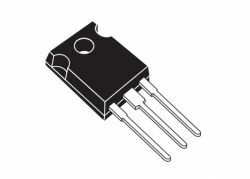 The devices are part of the new HB series of IGBTs, which represent an optimum compromise between conduction and switching losses to maximize the efficiency of any frequency converter. Furthermore, a slightly positive VCE(sat) temperature coefficient and very tight parameter distribution result in safer paralleling operation.